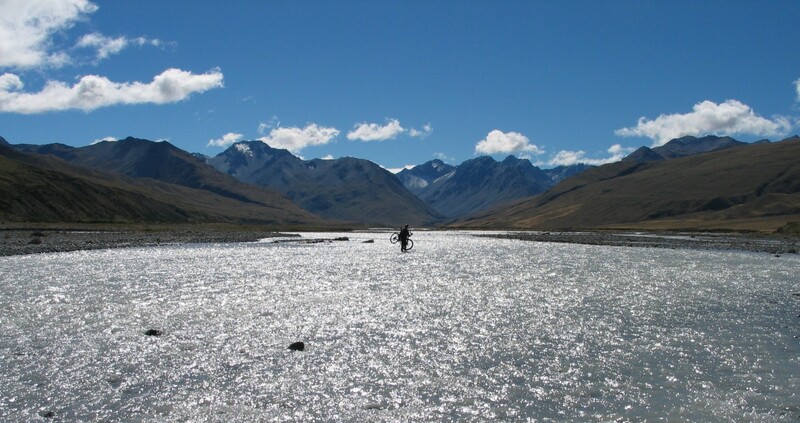 Nine day ‘full-on’ MTB tour… Top of the South Island. Day 1: Started in the Canterbury High Country with clear blue skies as we all headed up the long access road to the Craigieburn ski fields nestled at 1300m. The descent down The Edge Track is always a goodie as your tyres cling to the narrow slot across the scree slopes and then on down into the rooty beech forests below. (The old dead tree is always a good spot for a wee bit of bike art!) By this stage the legs are feeling well used but the climb is rewarded with a very long descent down into Castle Hill Village and for us a waiting shuttle to take us to our overnight accommodation at Flock Hill High Country Station. and eventually out into the clouds on the open tops at 1320m and the last 5km on to Ghost Lake hut nestled at 1200m for our overnight accommodation. Day 4: The expected bad weather arrives with rain and low cloud and a phone call to the local helicopter company confirmed there would be no landings on the tops today. Undeterred we headed off for Blackball to take on the Croesus Track up in the Paparoa Mountains with a ride up and back with a target of Ces Clarks Hut perched just below 1000m. The rain came and went and the wind was blowing pretty well on the open tops but we made it to the hut for a lunch stop before a rapid descent on the rocky track where we then used the trailer as a changing room as the rain bucketed down, all then retired to ‘The Blackball Hilton’ pub for a few beers and a good meal. Day 5: We abandoned Reefton and the rain and headed over to our next stop in St Arnaud hoping that the rain might be lighter inland. Arriving in the dry we got kitted up and rode out of town to try out the Teetotal Trails and although the rain caught us up and the temperature dropped sufficiently for the rain to turn to hail we still managed around four hours of riding, slipping and sliding! …and drive over to Nelson where we did manage to leave the rain behind and stretch our legs with the long climb up into the hills for the fantastic descent down ‘Involution’ one of the many great trails built around Nelson. Day 7: Travelled over to the Takaka Hills for the Rameka track with of course the now obligatory stop for coffee and pies… The sun was shining and a plan was hatched to split into two groups where the slower group would cruise through and the quicker group would have a double hit with our trusty shuttle driver waiting at the bottom for a quick 45km return back up and over the huge Takaka hill and back in on the 11km of gravel road to the drop off point for a second hit, a fantastic track well worthy of a double run. Day 8: We took on The Dun Mountain loop, starting in Nelson and climbing up to just under 1000m high on the mineral belt. A long steady climb is rewarded with wide open mountain views and 15km of downhill which is guaranteed to put a smile on your face. Day 9: Today the weather stayed fine which meant the planned Heli-Bike trip up onto Gordons Knob, east of Golden Downs high the Gordon Range of mountains was on. So we all hopped into the Minivan and on over to Reid’s Helicopter base in Wakefield and 10 minutes’ after take-off we were standing east of good old Gordon’s Knob at an elevation of 1564m, (5130 feet in old money). before following the poled route down the ridgeline (which wasn’t always rideable!) and out onto a fast fire road to our waiting vehicle kindly delivered by Reid’s helicopter boys, thanks guys! The Riders: Earl, Hana, Jonathan, Peter, Michaela, Ivette. Almost Spring on the Queen Charlotte Track. The forecast looked ominous for the weekend as we packed our gear for a Friday morning departure on the Interisland ferry, but hey it was still dry at that stage. Arriving around lunchtime in Picton we transferred to the water taxi for a 40km ‘cruise’ out to Ship Cove in the outer Sounds as the clouds gathered the rain began and the water started to cut up rough. By now it was mid-afternoon but we only had a couple of hours riding to Endeavour Inlet for our first overnight stay, but plenty long enough to get plastered in mud and wet to the skin, this was to be the theme for the next couple of days, but we had a roof over our heads for the night and a place to dry out and enjoy a good feed. Day two dawned grey with showers wiping through on a stiff breeze as we ventured out in our dried out gear which at least felt good for the first half-an-hour of our five hour ride. As with day one the descents on the clay surface which resembled small streams in places made for ‘lively’ riding and it wasn’t difficult to smile once we reached the bottom still in one piece. Again a comfortable overnight stay awaited us with good food and an opportunity to dry out and prepare for the next day. Raring to go, day three. Day three had an even split with 20km of the track remaining and 20km of road and a new trail back to Picton, complete with a bike (and person) wash facility at the tracks end, Anakiwa. The ride back to Picton took in an excellent piece of new MTB trail running alongside and far above the road complete with a hammock and it had stopped raining! Finally a pre-arranged shower and clean-up awaited us in Picton before a return trip on the Interislander and a couple of days at home cleaning gear, servicing bikes… … that’s the QCT on a wet weekend. The weather had been dodgy all week and Saturday was terrible, wind, rain, the works. And so Sundays proposed ride along an exposed westerly coastline near Wellington was going to be an adventure. But as is often the way if you just stick with the plan you can be rewarded with the unexpected, in this case the weather turned on a cool and breezy but bright day. Lots of wind turbines to catch the regular wind that blows through Cook Strait. Information here about the wind farm. Meridian Energy, Project West Wind. And after a lunch stop at Opua Bay we searched out some good technical riding along the cliff tops before a descent back to Makara beach and a cup of coffee in the local cafe. We have just had a great weekend reconnaissance ride around part the Wairarapa Coast over on the southeast corner of the North Island, stayed on an old sheep and beef station nestled between the hills down on the coast which has been run by the same family since the late 1800’s. Gordie having arranged a shuttle run back towards Martinborough made sure we were all loaded up and ready to go for the one hour trip back to a nice (if not cool) high point start next to the Hau Nui wind farm which was New Zealand’s first commercial wind-farm built in 1996. The trip up the coast was fairly uneventful until we reached ‘The Slip’, there was then some discussion on our options to navigate this before we set off down and across the Rerewhakaaitu River (try saying that after a bottle of port [Grant]) and climbed before reaching the slip which involved some challenging traversing! Sunday dawned bright and the wind had swung round to the west and strengthened which cleared the skies and added a challenging crosswind later on the return leg along the coast. We had picked a circular route to the north which involved a good honest climb to start the day and warm up those muscles. After the excitement we had a pleasant ride back along a wild and windy coastline before hitting the road and heading for home. A great part of the country for some good scenic riding, no special single track but plenty of options to ride where there were no tracks at all… And just a note, this ride was over private land and requires the landowners permission for any access. And some more; Makara Peak MTB Park. And finally a few of Marianne riding the Surly ‘Ice Cream Truck’ along the beach at Kapiti.